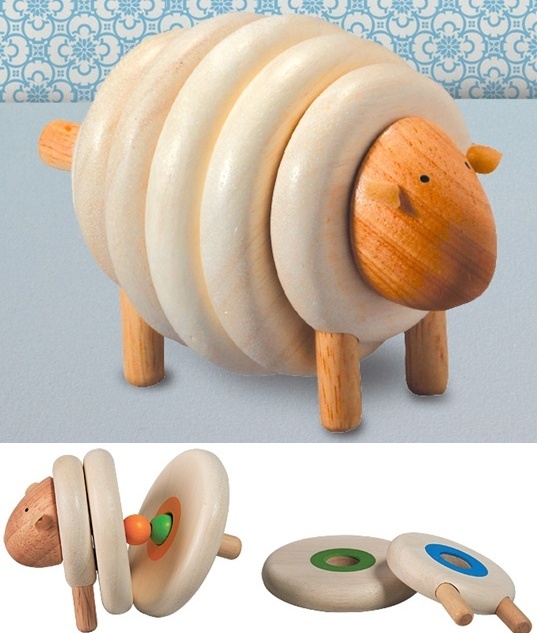 The Wooden Lacing Sheep by Plan Toys is an ideal educational toy for tots. It encourages hand-eye coordination, while helping kids learn about color and sequence as they piece together the discs to give the sheep its wool. Made with natural rubber wood and non-toxic finishes, this little sheep is also perfect for parents who want to keep their child’s playroom healthy and chemical-free. + Warm Biscuit Bedding Co. The Wooden Lacing Sheep by Plan Toys is an ideal educational toy for tots. It encourages hand-eye coordination, while helping kids learn about color and sequence as they piece together the discs to give the sheep its wool. Made with natural rubber wood and non-toxic finishes, this little sheep is also perfect for parents who want to keep their child's playroom healthy and chemical-free.